One chapter of the fight over outdoor wood boilers is on the verge of ending, as EPA regulations are prepared to ban the sale of unregulated boilers in the 38 states that still allow them. And virtually all the main stakeholder groups, from industry to air quality agencies, agree that this will be one of the best things about the upcoming residential wood heater regulations set to take effect in the spring of 2015. A decision by the EPA in the mid 1980s to not regulate residential wood-fired boilers, also referred to as hydronic heaters, seemed reasonable at the time. Fossil fuels were cheap and our nation was turning away from wood heating and quickly adopting electricity and gas as heating sources. But starting around the turn of this century, a boiler design emerged that became increasingly popular, spawning a few dozen small businesses, some running out of garages and barns. The design appeared brilliant: put the boiler in the backyard next to your woodpile and pipe the hot water underground. But they had one big drawback. They had a water jacket around the firebox that continually cooled the fire, keeping it from reaching temperatures that combustion needs to be clean and efficient. 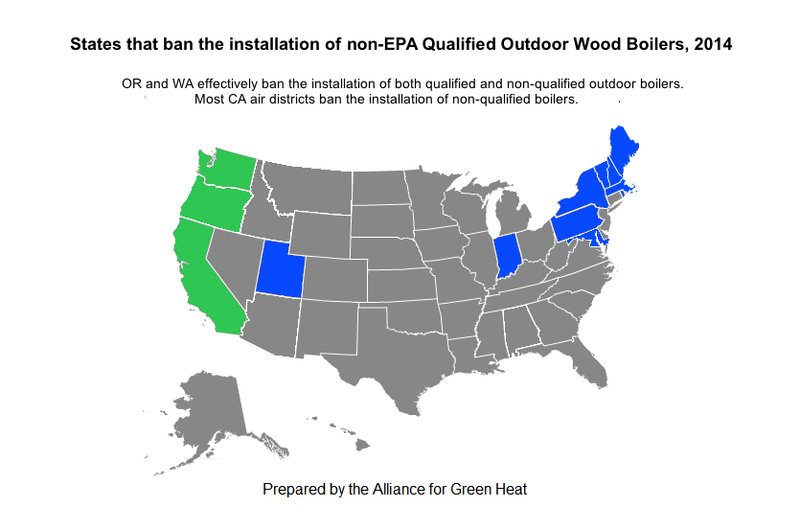 Outdoor wood boilers are one of the reasons that states and non-profits are demanding stricter EPA emission limits not just for boilers, but also for stoves and furnaces, which are all coming under more scrutiny. In the absence of federal regulations, a dozen states either effectively banned them, or only allowed models that met stricter voluntary emission standards. Vermont was the first state to require this in 2005 and Utah was the last in 2013 before federal regulations, known as New Source Performance Standards (NSPS) will take effect in 2015. These regulations will close the chapter on installing new, unregulated boilers in the US, but the hundreds of thousands of existing boilers already installed still cast a pall over the wood heating community, reducing neighbors property values and forcing some families to leave their home, rather than breathe the dense smoke that often comes from these boilers. New battles are already looming around outdoor boilers, as the Hearth Patio and Barbecue Association (HPBA) fights for a one- year period to sell off existing inventory of the unregulated boilers. States and air quality groups oppose this additional year and the EPA will decide by February 3, 2015 whether to allow the additional year of sales, as well as how many pounds of particulate matter the boilers can emit in 2015, and how much tighter the standard should be by 2020. Litigation is likely, but relief is not likely to come soon enough for companies like Central Boiler, the leading manufacturer of both unregulated boilers and the cleaner models. Central Boiler has fought regulations in state after state to continue selling their unregulated models, while at the same time building cleaner EPA Phase 2 models for the dozen states that ban their unregulated ones. Their most popular models are the unregulated ones and currently, their dealers do not know if they can sell them after next spring. Many dealers are telling customers to buy and install now, while they still can. The outdoor wood boiler industry is also pitted against the importers of more sophisticated European technology, with the US importers fighting for test methods and emission standards that are geared towards European technologies, which are more likely to include oxygen sensors, thermal storage and high temperature combustion. The battle over the future of outdoor boilers is a microcosm of many similar battles about our energy future. More than a dozen Republican lawmakers are demanding that the EPA drop these regulations that they say will make this age-old American tradition of heating with wood prohibitively expensive. Democrat lawmakers are more focused on reducing pollution. Both sides claim they are they are supporting the future of a low carbon fuel source. But many battles will remain with the states, as property line set backs and stack heights are still considered vital by many states who don’t want outdoor boilers in suburban neighborhoods or where a neighbor’s house in only 100 or 200 feet away. While the cleaner models are cleaner when used properly, they still can be misused by operators who load them with un-split wet wood, or even worse, with household garbage that cause plumes of smoke to blow through valleys shared by other families. Update: In August 2014, Connecticut announced a outdoor wood boiler buy-back or replacement program. (The program is now closed.) What makes it significant is that they are only allowing boilers that emit no more than .06 lbs of particulates per MMBBTU, which is far lower than the current EPA voluntary standard of .32 lbs/MMBTU. Woodmaster is one of the only company that makes boilers that clean, along with a number of European pellet boilers such as Maine Energy Systems and others. The state does not require the replacement boilers to be part of the EPA voluntary program, but only requires that they meet the low emission requirement.